Facebook Places is a location-aware service from Facebook which allows Facebook user on mobile to easily share the location where he or she is, what he or she is doing and the friends who are together with. By checking in to a place in Facebook Places, one can connect to friends who happened to be at the same place in real-time, and to find local deals too. Facebook Places was initially rolled out to US-based Facebook users only on August 2010, and has since been expanded to support more countries, including Uited States, Canada, United Kingdom, Australia, France, Spain, Italy, Germany, Switzerland, Denmark, Norway, Sweden, Hong Kong, Singapore and Taiwan. Thus, if you’re not in one of the supported countries, you cannot access and check-in to the Facebook Places, even if you’re resident from one of the supported country. However, there is a simple hack available which makes Facebook Places available anywhere and everywhere around the world with Internet connection. The trick is by using VPN (Virtual Private Network), which is located in within United States of America. 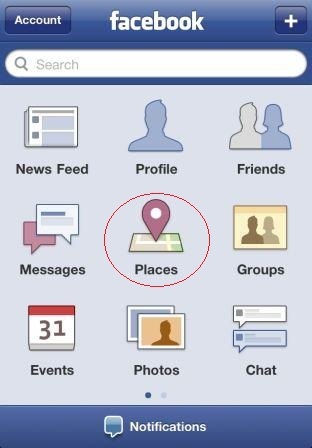 Facebook Places is available via Facebook’s mobile website (http://touch.facebook.com) or Facebook’s mobile apps for smartphone platforms such as iOS (iPhone, iPod touch or iPad), Android and BlackBerry. The trick to access Facebook Places via VPN service can work on any platform that support configuration and setup of VPN connection. One of the VPN that is available freely and commonly used in Hotspot Shield, and it allows user to has a US IP address when surf the Internet through its VPN. Of course, there are many free and commercial VPN services that are available in the market, and if you happens to have one alternative, just replace the VPN information in the guide below with the details provided by your VPN service provider. The guide is based on iPhone, however, similar steps should be applicable to other mobile platforms and even computers. 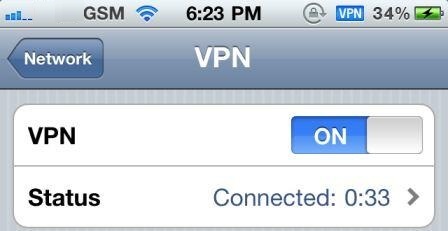 Configure and setup Hotspot Shield free VPN on iPhone. Go to Settings -> General -> Network -> VPN, and turn VPN to ON to activate the VPN, and then wait till the VPN is connected with an VPN icon shown in status bar and “Status” shown “Connected”. Run the Facebook app and tap on the Home button on the top left corner to reveal the menu. Tap on the Facebook Places icon to access Facebook Places. Alternatively, open Safari and browse to http://touch.facebook.com. A list of friends with recent check-ins will be displayed, and to share your location with friends, just tap on Check In button to select or add a nearly place to share. Once checked-in, you will have option to tag along the friend with you and to upload photos or videos.